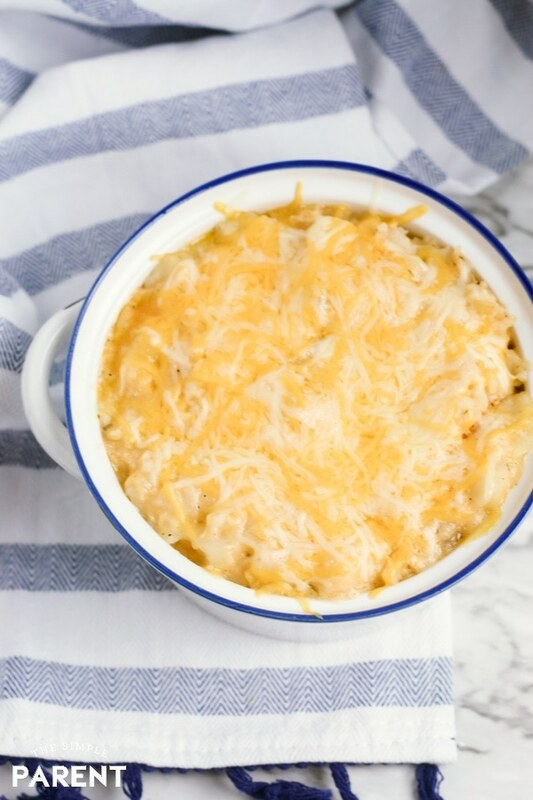 Home » recipes » Crockpot Cheesy Potatoes Family & Friends Will Love! 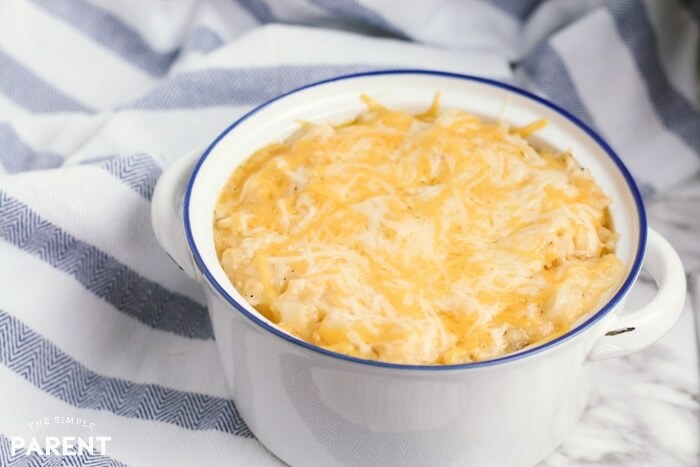 Crockpot Cheesy Potatoes Family & Friends Will Love! 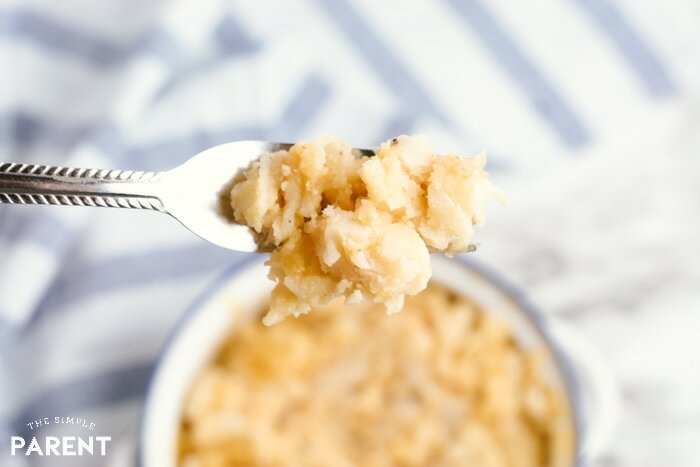 When it comes to delicious side dishes that are easy to make, Crockpot Cheesy Potatoes are a favorite around our house. I mean, what’s not to like? We’ve got CHEESE and POTATOES! Two of my favorite things! Pair it with the fact that I can throw it all in the slow cooker and end up with a delicious side dish for dinner (or even for breakfast) and I’m in! Slow cooker cheesy potatoes, funeral potatoes, party potatoes… whatever you call them, you know they’re AMAZING! They’re also pretty addictive but what do you expect when you put together potatoes and a bunch of cheese? You know it’s going to be GOOD! If you’ve ever heard of funeral potatoes and you’re wondering where that name came from, this dish is traditionally served at funerals. But it makes a great comfort food dish for any large party or pot luck. You can make it for your family and save the leftovers if you don’t want to share with a crowd! We just stick to calling them easy cheesy potatoes so I don’t have to explain the whole funeral background to the kids before dinner. The ingredient list for this recipe might look a bit longer than most of our recipes, but most of it is seasonings so I promise this is an easy recipe! The great thing about using the Crockpot is that you’re pretty much guaranteed it’s going to be simple to make! You might have most of the seasonings in your pantry already. 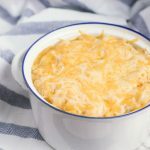 In addition, you’ll need potatoes, cheese, milk, and butter to whip up this Crockpot funeral potatoes recipe! You’ll notice we don’t use cream of chicken soup in our recipe. The milk and butter do a great job of giving us great flavor and a good texture. 1. Place the frozen potatoes in the Crock Pot and season with salt, pepper, parsley, paprika, garlic powder, and onion powder. Mix to combine. 2. Add 1 cup Colby Jack cheese and 1 cup Sharp Cheddar cheese. Mix to combine. 3. Pour in milk and top potatoes with pats of butter. 4. Place the lid on the slow cooker and cook on LOW for 4 hours or HIGH for 2 hours. Stir halfway through. 5. 10 minutes before serving stir potatoes and sprinkle the remaining Colby Jack and Cheddar Cheeses on top. Turn the Crock Pot off and replace the lid. 6. Once the cheese is completely melted, serve and enjoy! Place the frozen potatoes in the Crock Pot and season with salt, pepper, parsley, paprika, garlic powder, and onion powder. Mix to combine. Add 1 cup Colby Jack cheese and 1 cup Sharp Cheddar cheese. Mix to combine. Pour in milk and top potatoes with pats of butter. Place the lid on the slow cooker and cook on LOW for 4 hours or HIGH for 2 hours. Stir halfway through. 10 minutes before serving stir potatoes and sprinkle the remaining Colby Jack and Cheddar Cheeses on top. Turn the Crock Pot off and replace the lid. Once the cheese is completely melted, serve and enjoy! If you want to use corn flakes or French Fried Onions as a crunchy topping for these funeral potatoes, there are a few adjustments to make. You’ll need 1 cup of your choice of topping. Add all of the cheese to the original mixture and cook on LOW for 4 hours or HIGH for 2 hours. 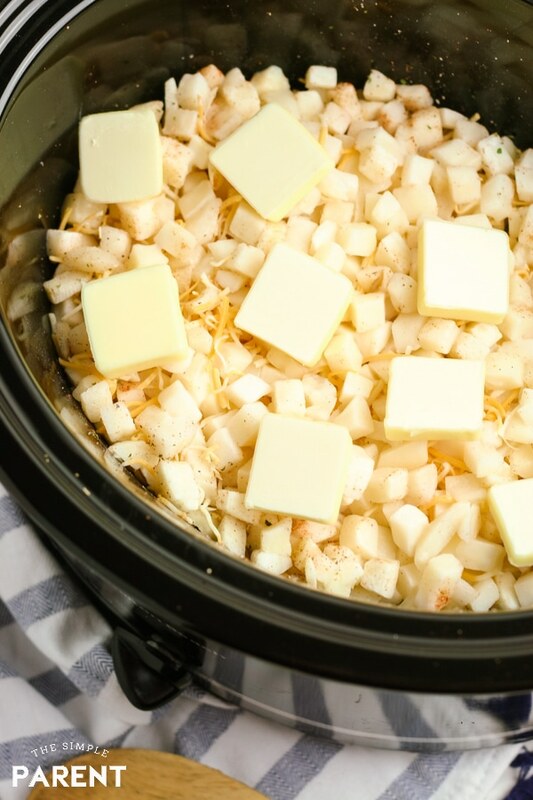 Take the lid off the Crockpot and sprinkle your cereal or onions on top of the potatoes. Place paper towels over the top of the Crockpot and put the cover back on to help keep the topping crispy. Then cook on HIGH for 30 more minutes. Is this the same as hash brown casserole? Yes, this is very similar to how you can make hash brown casserole in the slow cooker. We’ve used diced potatoes instead of hash browns. Can I use hashbrowns in this cheesy potato recipe? Absolutely! Just substitute one bag of frozen shredded hash browns (30 ounces) for the bag of diced potatoes. Shredded potatoes do have the tendency to make a mushier Crockpot party potatoes but they still taste delicious! You can also use frozen O’Brien potatoes for another option! 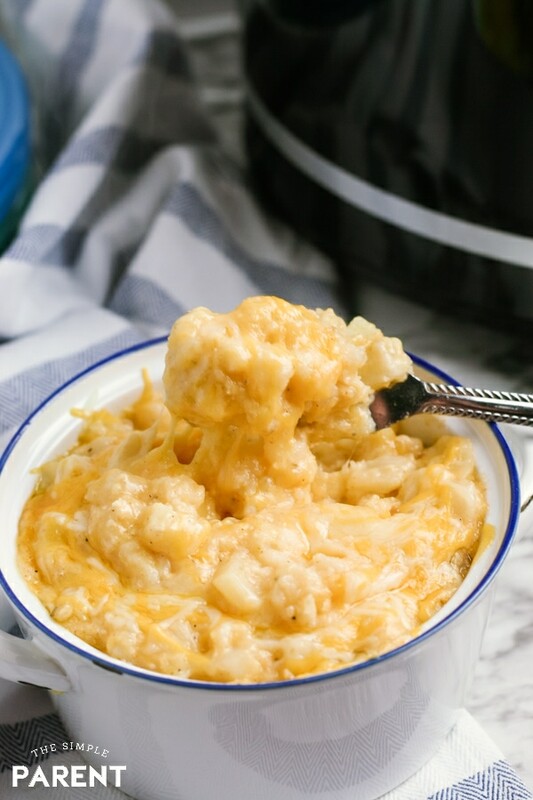 Can I make Crockpot cheesy potatoes with real potatoes? You can do that as well. You will need a bit more prep time, but you prepare raw potatoes by either dicing them or using a cheese grater to shred them. You’ll need 1.5 – 2 pounds of russet potatoes. Can I add meat to this funeral potatoes recipe? YES! Ham is a very popular addition to Crockpot cheesy potatoes! But ground beef also works well. If you’re looking to turn this easy side dish into a main dish, adding meat is a great way to do it! If you’re adding ham or ground beef, you should use about 1 lb of meat. I do recommend browning the ground beef before adding it to the slow cooker mixture if you’re using it. I want to add a crunchy topping like my oven party potatoes recipe. How do I do it? If you like the crunchy topping with this Crockpot potato casserole, you can use corn flakes. It’s a very traditional way to add a crunchy topping to cheesy potatoes but I have some other tasty suggestions. You can try French Friend Onions too (so good!) and I’ve also seen some people use Rice Krispies cereal. If you want to use corn flakes or French Fried Onions, there are a few adjustments to make. You’ll need 1 cup of your choice of topping. Add all of the cheese to the original mixture and cook on LOW for 4 hours or HIGH for 2 hours. Then take the lid off the Crockpot and sprinkle your cereal or onions on top of the potatoes. Place paper towels over the top of the Crockpot and put the cover back on to help keep the topping crispy. Then cook on HIGH for 30 more minutes. We made these party potatoes in honor of the Big Game! And to continue the celebration, we’re giving away a $50 Amazon gift card to one lucky reader! To enter for your chance to win, leave us a comment! Comment below and tell us where you’d serve Crockpot Cheesy Potatoes! Take them to a pot luck, make them for Thanksgiving, Football Sunday, or when? Then use the widget below for more chance to win! The giveaway is open to US residents, 18+, and ends on February 21, 2019! Good luck! If you enjoy this recipe, we’d love for you to leave a rating! All you have to do is click the stars by your comment box to let us know! We love 5 STAR ratings (obviously) and if you have any suggestions, we’d love to hear those too! « Join the #BUSHSChiliBeans Twitter Party! I would serve it to my family at home on weekends, it would be such a great family meal. I would serve this recipe on a regular basis – everything we enjoy eating. Don’t need a special day/occasion as a family meal is the special occasion. I would serve this to my monthly potluck at the office. I’d serve Crockpot Cheesy Potatoes at home. I’d serve Crockpot Cheesy Potatoes at home. My family would love it. Thanks for the giveaway! I would serve it at home. Everyone would love it. I would serve them at my family’s Easter dinner. I would serve crockpot cheesy potatoes for family dinners at home. I would serve it at dinner time! My family would love these. I would serve them anytime at a family dinner. I’d serve them at a potluck at the racetrack. I would serve it at my moms group that I go to. They would love it there. I would make these for a Sunday family dinner! I am going to add ham and serve it for dinner. I would serve these at home and at potlucks with friends. I would serve this at home for my family! 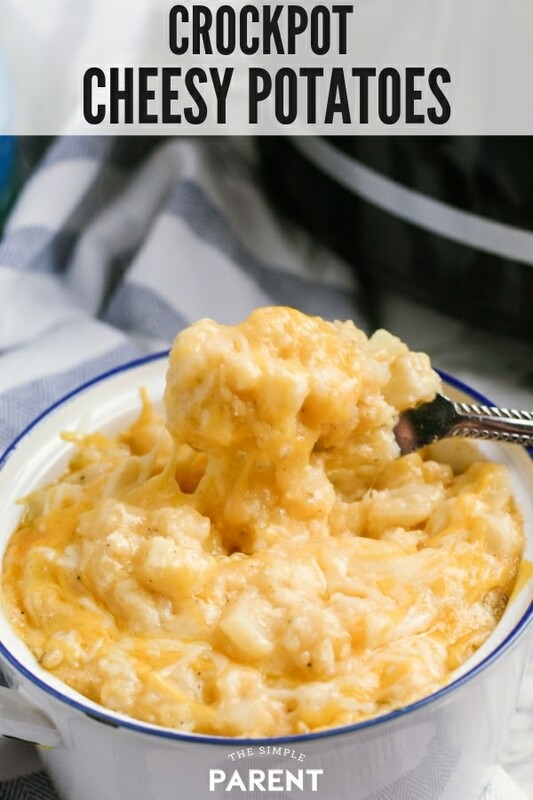 I would serve crockpot cheesy potatoes for Sunday brunch. I would serve it to my kids on a weekend night! I think they would make a good Thanksgiving side dish. Thank you! I would take these cheesy potatoes anywhere that I need a dish to share. I would try these at home. I would serve these on a cold snowy day. I am the worst cook in these United States! But I could make this and eat it at home. I would love to bring it to a work potluck! This looks soooo delicious! I’d serve it at home to my neighbors when we get together. I’d make it at home for us to enjoy during the whole week (and freeze some for future enjoyment!). would take it to the potlucks I am invited to. I would serve these as aside for dinner. We eat at my bothers house and him and his wife eat at our house all the time, so this would be eaten on one of those days. We always try to one-up each other. Oh I would love to take these to my parents house when we celebrate our family birthdays each month! We all bring something…this would be perfect and looks so delicious! I would serve this for Easter dinner with my family. I would serve it to our friends at our next get together. Great cheesy side dish yummy! These would be good for dinner at home! I’d serve it at home for my husband and kids. I would serve at potluck party. I’d serve them at home. I think they would be a hit here. Crockpot Cheesy Potatoes would be a great dish to take for the teacher appreciation lunch put on by the PTA. I bet the staff would love it, and it would be easy to bring and keep warm. Theylynsg would be good either at home or at a family get-togeher. I’d serve it at the next holiday gathering. I would serve with family dinner. I would serve them for Sunday dinner. I would have my son & his family over for dinner. They love those. I like to make these for Sunday Dinner. I would make this for my next family dinner! I would serve crockpot cheesy potatoes at the family get-togethers. I would serve the Crockpot Cheesy Potatoes for holiday dinners. I think they would be really good at Easter. I’d serve it for dinner on a cold, snowy night like tonight. Cheese + potatoes are my family’s favorite food groups. I’d serve them at meals, or on a game-day buffet table. I would serve them to my family. I’d serve Crockpot Cheesy Potatoes for Thanksgiving. I would serve them at home when my kids came over, or at work during pot lucks! I would serve it anytime with beef , scrumptious! Thank you for the giveaway. This dish could be served in so many places! I would serve it at home, gatherings, picnic, and fellowship. I’d serve it during family dinner. I would bring a batch down to the Veterans homeless center. These would be great to serve at book club meetings. My family loves this recipe so I fix often. I’d serve these at home. I’m sure they would go over well. I would serve this to my family. The pics look soooo good! I would add some ham and serve as a meal to my family!!! I would serve these at our family potluck and holiday dinners. I’d make and eat them at home. For dinner to make it more special. I would take them to our monthly pot luck dinner. It would be fun to make this a regular Monday supper side dish for home – make Mondays something to look forward to, or at least end with a flourish and a happy tummy! I would serve this for dinner to my family! It looks like something we would all enjoy. My mother in law is coming to live with us. I’d serve this to make her feel at home and celebrate. My children would love these potatoes, so I’d serve it at home. I would bring Crockpot cheesy potatoes to the next potluck I go to. My family loves quiche and I would pair this with quiche and a salad.